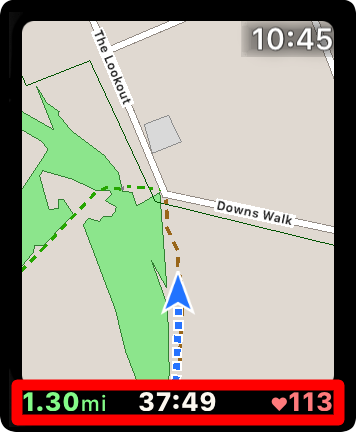 WorkOutDoors is the only workout app that displays a fully functional vector map (like maps on the iPhone). The map contains all the information necessary for outdoor workouts, including paths, trails, tracks & pistes. The use of vectors mean they can be smoothly panned with your finger and zoomed with the digital crown. The data is from OpenStreetMap and can be cached on your watch for use when there is no data signal. The map can rotate to match the direction of travel. 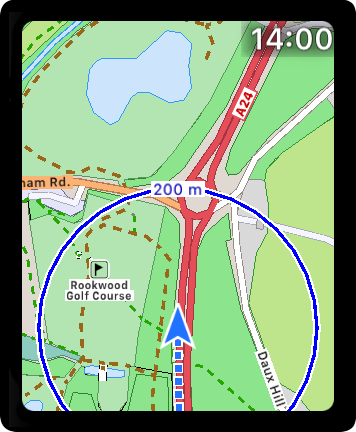 When in this mode the GPS location is shown below the centre, to show more detail ahead than behind. The optional red compass points towards the north. Tap it to turn auto-rotate on or off. A series of blue dots marks out your whole route. The dots are grey where the GPS signal was poor. If you pan away from your location, then a Tracking button appears in the bottom left. Tap it to resume tracking. You can use your finger to pan across the map in any direction. You can zoom in or out by using the digital crown. A scale is shown as you zoom, making it easy to determine how far away places are. 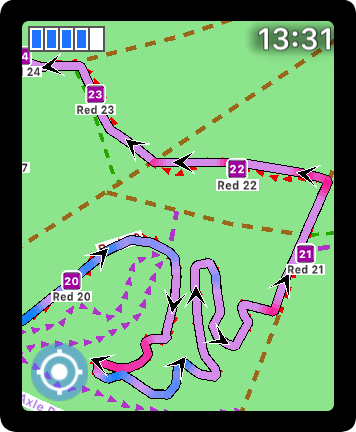 GPX Routes can be imported and displayed on the map. The colour of the routes indicates the elevation. Uphill stretches are shown in red and downhill stretches are shown in blue. Routes can be configured to be shown as "Hollow". This means they appear as twin lines either side of the trail to follow. 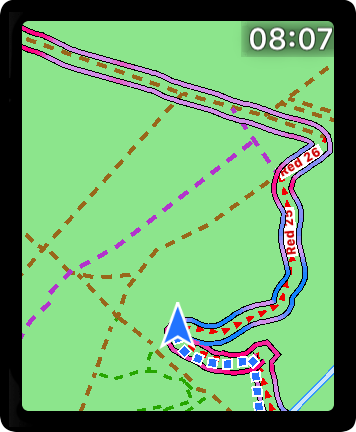 This allows the user to see the trail types and names, rather than have them obscured by the route. 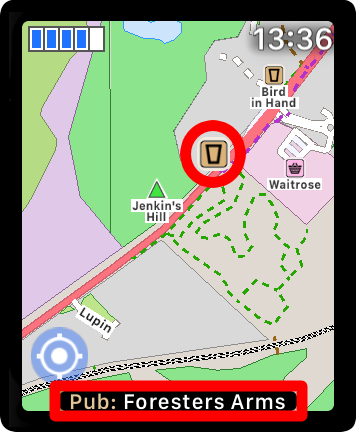 If the GPX route contains waypoints then these are shown as icons on the map, with the waypoint name underneath if room. 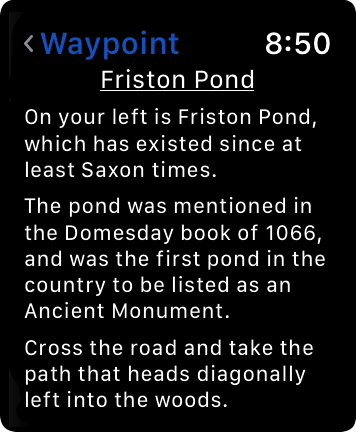 If the waypoint has a detailed description then this is available by tapping the icon. The workout statistics shown can be changed by double-tapping to cycle through the available values. The text size is also configurable. Double tap the map to hide the statistics and use the full screen for the map. Double-tap again to restore. A map can be displayed without starting a workout. All of the same map functionality is available as when running a workout. 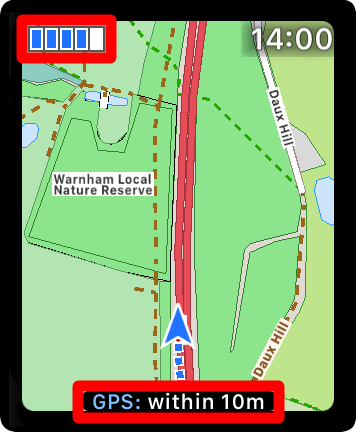 In this mode you can control how long the GPS stays on, to help minimise battery usage. The optional green compass points in the direction of where you started your workout (marked by a green circle). Tapping the green compass shows the distance to this starting position. The GPS Signal strength indicator is shown in the top left corner. Double-tap that area to hide it or display it again. 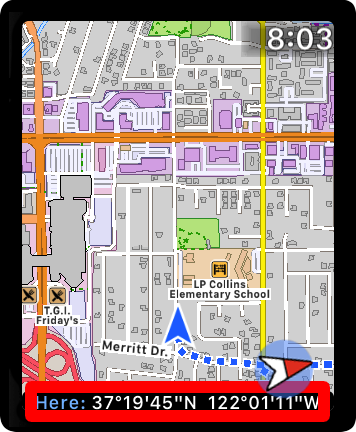 Single tap the indicator to show the exact GPS accuracy at the bottom of the screen. 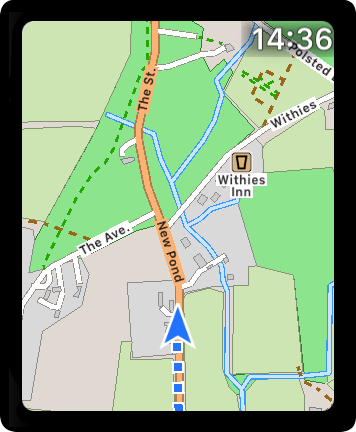 You can see more information about POIs or road names by simply tapping them. The POI or name will enlarge to be more visible, and details will be shown temporarily at the bottom of the screen. 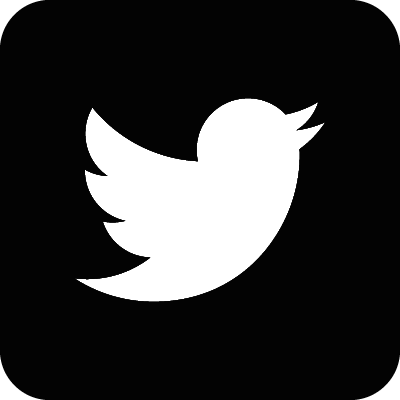 There are loads of other features available by tapping or double tapping items. Tap the GPS arrow to see the latitude and longitude. Or tap the time to see it in full, with seconds. Double tap controls to hide or reshow them. 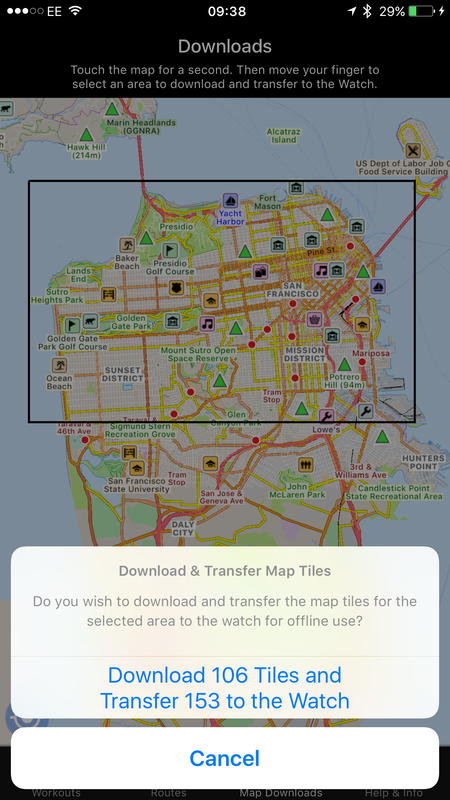 The iPhone app allows areas of the map to be downloaded and transferred to the Apple Watch, for use offline. 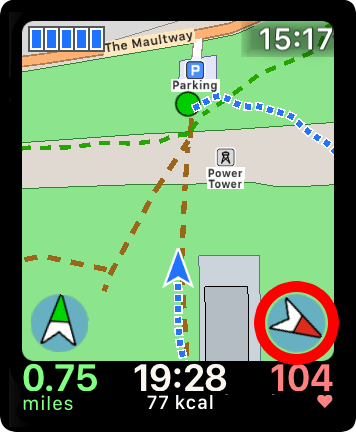 This allows you to use the maps even without a data signal, and if you have GPS on the watch then you do not even need to bring your iPhone! 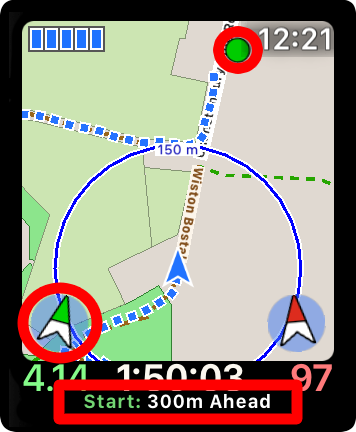 Downloading the maps in this manner also makes them quicker to draw on your watch, because it does not need to download them before drawing.